Only four years. It is WID and DORMY to have been born to expand this time. There are many a variety of friends beyond a school year and a department, a native place and the nationality.There are also many a variety of events and share space that it was done an exclusive design to grow up. A one furniture private room with the preparation which I can be devoted to. And breakfast and the dinner of the handicraft that every day begins in health. WID and DORMY are not just student dormitories. It is the house for the endless future. International student dormitory WID for exclusive use of the Waseda University students. 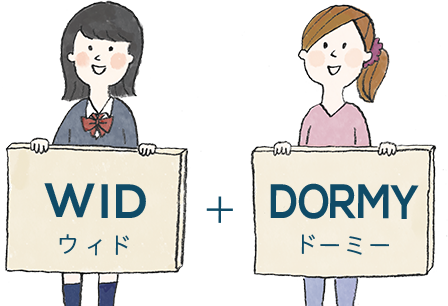 DORMY and DORMY share house of the Waseda University recommendation that can interchange with other universities.Please choose the house which matched oneself. The interchange event program that the age and the country and the department are beyond. In WID and DORMY, We prepare for many events including a reception.the unique examples are such as the real Mario cart and ninja experience, a carrier seminar, the beach volunteer. The assist by a chosen upper-class student. there is the upper-class student who received the training lives in the dormitory as RA (resident assistant).RA is selected fairly in WID by a university and supports a dormitory resident. Please takes care of a connection. The effective utilization of approximately 600 hours. It is with two meals of morning and evening. The best balance of nourishment and the taste. The cooking staff is handmade based on the recipe that a professional administrative dietitian devised heartily. We offer the meal that balance of the nourishment was compatible with homey warmth in morning and evening of the moon – soil. It is not necessary in preparations for cooking food for oneself and the time for clearing either. ※The meal offer time varies every article. ※The meal offer on employee training day, seven days of the march,end of the month for year-end and New Year five days,fivedays in summer,the fifth Saturday,holiday and Sunday is absent. The always clean hall where convenient facilities are even on. The joint ownership space is substantial to enjoy student life comfortably. In the joint ownership space of a dining room, the statement corner, you can meet a person going to the different department, and there is the information exchange. ※Having facilities or not and the specifications are different every article. The furnished room of the complete private room which can start immediately. The minimum furniture and equipment necessary for life are provided for the room beforehand. There is little moving baggage and is comfortable and is very economical. There is the arrangement in the room of the oneself preference, too. The relief that a person is near to be able to rely on. It is the biggest security. It is the arrival to the campus within approximately 30 minutes. As for the experience to enjoy world TOKYO. You can access each campus by foot and a train in approximately around 30 minutes. In addition, the article kept on choosing you is easy to have access to each Tokyo place and can fully enjoy various big cities, Tokyo.